I know that my posts have been sparse as of late (life got busy this month), but I intend for that to change next week. My hope is to have 3 new posts up regarding potential weaknesses for a Hillary 2016 primary run (based on '08 exit poll data), public perceptions of Howard Dean in light of his openly considering another presidential run, and a comparison of Presidential job approval and favorability throughout the last three presidencies. Gubernatorial candidates John Hickenlooper (left) and Tom Tancredo (right) debate in 2010. Photos courtesy of Floyd Brandt. Quinnipiac University lit up the twitter-sphere this morning after releasing their first survey of the 2014 Colorado Governor's race showing anti-immigration firebrand and 2010 loser Tom Tancredo (R) trailing the once popular Gov. John Hickenlooper by ONE point, 42-41%. Hickenlooper burst onto the scene in 2010, a year not remembered for impressive Democratic landslides by any stretch. Yet that was what the 1-term Colorado Governor accomplished when he defeated Tom Tancredo (Constitution Party) and Dan Maes (R) in a 3 way race, 51-36-11%. Compiled from TPM Poll Tracker and various internet searches. But a series of deeply unpopular legislative moves have eroded the good will and bipartisan support he enjoyed his first two years (such as granting a temporary death penalty reprieve for a convicted murderer, a move opposed by 67% of Colorado voters, according to Quinnipiac). And though polling data has been limited so far this year with regards to Gov. Hickenlooper's job approval, the two pollsters to survey this question have shown serious deterioration in his numbers. Public Policy Polling had previously measured Hickenlooper's job approval just before the presidential election, when he clocked in with an impressive 55/26%, or +29. But just 6 months later, their April survey found him at 53/44%, a net 20 point drop. Quinnipiac's shift was even more drastic, if you can believe it. They too found Hickenlooper's job performance widely admired in their last survey taken pre-election (59/21%, +38). 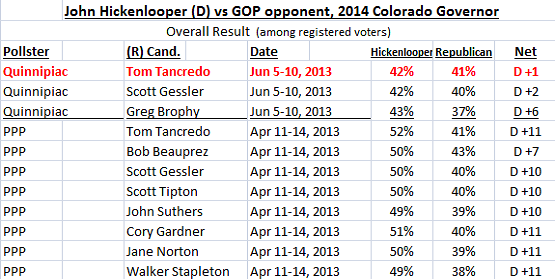 Yet 9 months later, in the survey released today, they find Hickenlooper's ratings have collapsed by a net 34 points! 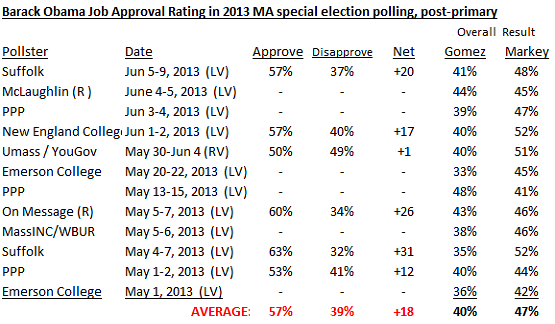 A Rising Tide Lifts All Boats: Will Obama's Improved Standing in Massachusetts Carry Ed Markey Over the Finish Line? Obama''s campaign visit wasn't enough to lift Martha Coakley in 2010, perhaps because his job approval was low, even for a state as Democratic as Massachusetts. But the President will be in a much better position when he campaigns for Ed Markey Wednesday. Photo on left courtesty of Michael Dwyer/AP/Corbis, photo on right found here. With the Massachusetts special senate race just over two weeks away, pollsters are providing us with a mini-avalanche of new data, a great deal of which appears conflicting at times. But one thing the pollsters seem to agree on this go 'round is the level of Massachusetts approval for the job President Barack Obama is doing in Washington D.C.
Several polling firms did not test Obama's job approval/disapproval rating. 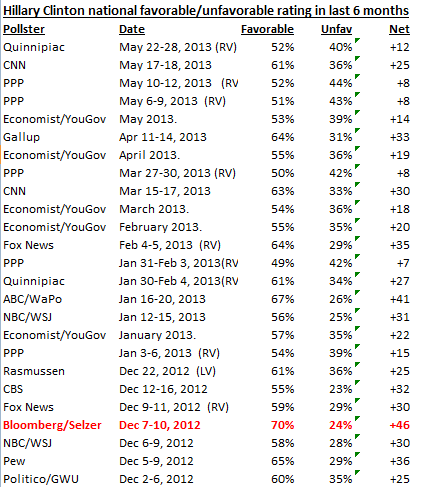 Only pre-election polls that surveyed Obama's job approval/disapproval rating are included in the above chart. 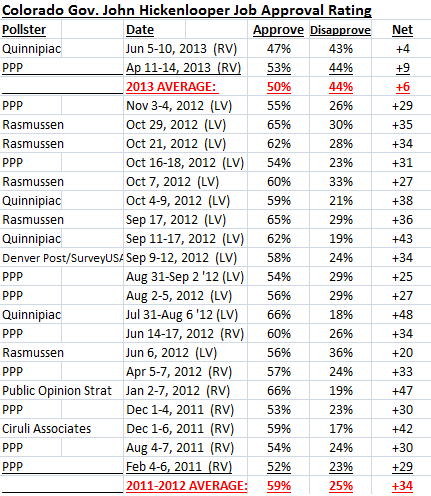 Data compiled from Real Clear Politics and Huffington Post Pollster. 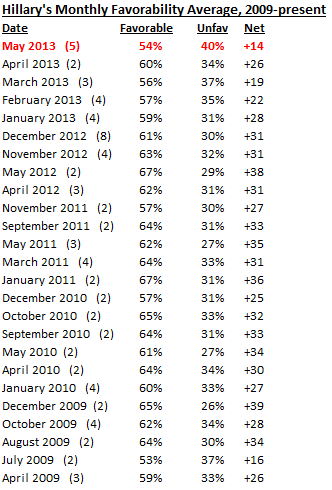 2010 "likely voters" were much more down on the job the President was doing then than they are now. His average rating is a net 10 points lower than it was in Massachusetts three years ago. His spread ranged from +1 to +16, though Rasmussen was the only pollster to show Obama's net approval rating as high as double digits. The rest found it in the low single digits.